It's been 214 days since Nick and Carter promised their friends they would stay home. Los Angeles County still has a warrant out for them both, so they've been good boys and remained within the 49 square miles of the City by the Bay. Nick, being Nick, gets carried away with Ben White's idea to build a back lot for Monumental Studios on a few hundred acres in Sonoma County and drives up to have a look around. Unfortunately, they stumble across a decaying corpse. Fortunately, the Sonoma County sheriff's deputy doesn't notice who Nick is and he safely makes it back across the Golden Gate Bridge where Mike and Carter have something to say about Nick's carelessness. 1961 is a fateful year for our boys and for the City they love. As usual, San Francisco is ahead of the rest of the country and change is in the air. A man who performs as a woman runs for political office, the district attorney announces to the world that he's not interested in prosecuting homosexuals for what they do in private, and the first salvo in the battle of the Jeanettes versus the Tonys is fired. Confused? 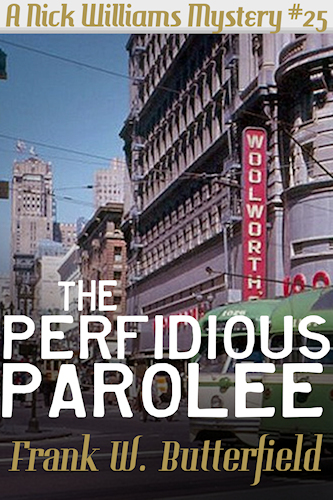 You won't be once you've read all about The Perfidious Parolee!